The activists of HALT EBOLA are primarily members of the NYC arts community, so our impulse has been to summon the resources of our creative community--and its audiences--for this cause. We aim to reinforce existing, experienced charities and NGO's with fundraising assistance. Our initial list of charitable recipients are highly-rated charities. At this first stage, we are limiting our support to charities located in New York City, in order to facilitate our working closely with them. We hope to mobilize our audiences to donate to Ebola relief by enabling a donation option through theater ticketing providers in our industry. After purchsing a theater, dance, film or music tickets, audience members will be offered the opportunity to donate for Ebola relief. We will enable a cell phone donations system so that producers and promoters can encourage their audiences to make donations before they turn cell phones off for the show. Mobilize public service announcements and solicit for donated air time on broadcast outlets to bring attention to charities fighting the epidemic. Radio is powerful in Africa. In collaboration with cultural anthropologists, we will create radio programming for the region that will educate and combat misinformation. Help us redesign this website and execute search engine registrations. Like this website, promote it through your own networks, to your audiences, associated artists and staff. 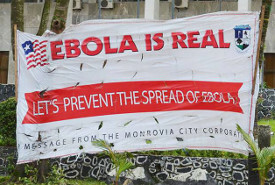 Help Ebola relief go viral! Offer your customers the option of making a donation to one of the charities we are supporting after they have completed a purchase. Work with your online ticketing company to enable your patrons to make a voluntary donation after buying tickets to your shows. Place ads for HALT EBOLA in your program. (Download prepared ads here.) Urge audiences to support HALT EBOLA in your pre-show announcements. Notify your audiences and supporters about your support of this campaign and urge them to make donations. Help us discover a great promotional idea like the ALS Challenge.